One of the main concerns about UAV, apart from privacy, is their safety. No one really wants to have a flying lawnmower falling from the sky, or buzzing near passenger aircraft. As drones become more ubiquitous, their safety systems are becoming increasingly important. One company that understands this issue, and is which is making constant progress in UAV safety systems, is DJI Innovations. Their consistent effort to improve the safety of their aircraft and to decrease the risk they pose already brought us No Fly Zone software, which prevents DJI copters from flying around airports and other prohibited areas. This time they are introducing a “Drop speed reduction system”, a complex name for something that is in essence a parachute. The system weighs around 500gr (~1.2 lbs), can be mounted on top od DJI S800 or S1000, and is deployed in half a second, in case of emergency. It also includes automatic power-off function, and is compatible with WooKong-M and DJI A2 flight controllers. Though the DropSafe system is designed to minimize damage to the drone and onboard camera in the event of an accident, it is not guaranteed that there will be no damage at all. 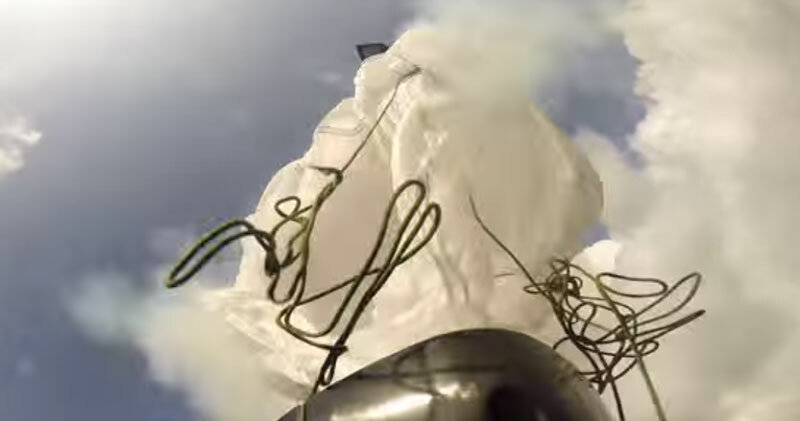 And with a parachute, there is also the possibility that the drone will be blown away or get stuck in a tree. Still, it’s better than having your drone and camera smash into someone. As with the above mentioned “No Fly Zone” firmware, it is reasonable to expect that the DropSafe and similar parachute systems will become standard UAV equipment in the near future.